Pope Francis wants to go to Iraq and has not given up on his plan. He also wants to meet the Patriarch of Moscow. 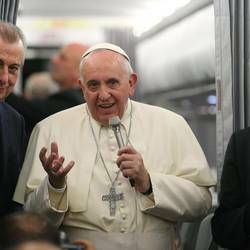 In the interview with journalists on board the return flight from Turkey to Rome, the Pope talked about yesterday’s events in Istanbul’s Blue Mosque. “The Orthodox accept the primacy: in today’s litanies they prayed for their pastor and primate, “he who leads the way”. They said this in my presence today. We have to look back at the first millennium to find an acceptable solution. I am not saying the Church did everything wrong (in the second millennium), no, no! It paved its historic path. But now the way forward is to follow John Paul II’s request. “On the anniversary of the genocide, when Erdogan was still Turkey’s prime minister, the Turkish government made a gesture which some considered too weak. But he was reaching out and this is always positive. Regardless of whether I hold my hand out a little or a lot, this is always a positive thing. The Turkish-Armenian border is an issue that is very close to my heart: it would be wonderful if that border could be opened! I know there are geopolitical problems that don’t help things much, but we must pray for this reconciliation among peoples. Many events have been scheduled for next year to commemorate the Armenian genocide, let us hope that the path of little gestures will be followed; small steps toward rapprochement.